DELISLE - L'Allemagne dressée sur les observations. . .
DELISLE, G ./ BUACHE, Ph. / DEZAUCHE, J. - L'Allemagne dressée sur les observations. . .
L'Allemagne dressée sur les observations. . . - DELISLE, G ./ BUACHE, Ph. / DEZAUCHE, J. Title : L'Allemagne dressée sur les observations. . ..
Map maker : DELISLE, G ./ BUACHE, Ph. / DEZAUCHE, J.. Size : 19.1 x 24.6 inches. / 48.5 x 62.5 cm. 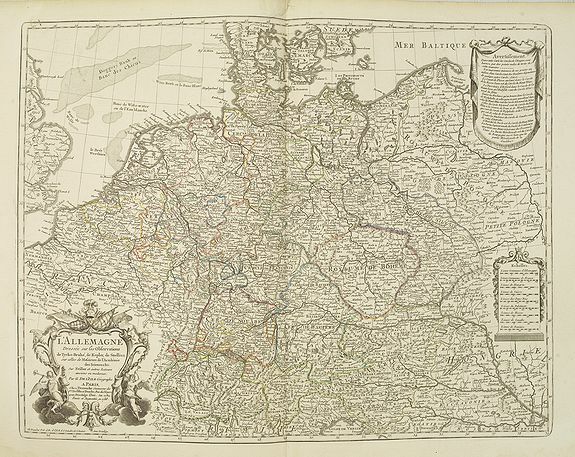 Description :Map of Germany, Low Countries, Poland, Switzerland, Northern Italy. Prepared by G.De L'Isle after observations by Kepler and Tycho Brahe. Engraved by Jean Batiste Liébaux. Several old addresses are deleted. This edition with the date 1788. Philippe Buache de la Neuville was born in Neuville-en-Pont (France) on 7th February 1700 and studied at the Académie des Sciences, where he won the first prize for architecture in 1721. He subsequently joined the Ministry of the Navy, where his drafting skills enabled him to concentrate on cartography. In 1729 he became geographer to the king, then geographer in the Académie des Sciences, successor to his former teacher and father-in-law, Guillaume Delisle (1675-1726). He pioneered a new form of theoretical geography and, in 1755, was appointed Professor of Geography. More than a copyist, Buache was an academic geographer who researched his material thoroughly, relying on the most up-to-date information from voyages of discovery. He was the first geographer to recognize the important concept of the watershed and it was this that led him to make a number of deductions, some correct, some not. Buache was trained under the geographer Guillaume Delisle, whose daughter he married, and whom he succeeded in the Académie des sciences in 1730. Buache was nominated first geographer of the king in 1729. He established the division of the world by seas and river systems. He believed in a southern continent, an hypothesis which was confirmed by later discoveries. In 1754, he published an "Atlas physique." His nephew, Jean Nicolas Bauche (born La Neuville-au-Pont, 15 February 1741 and died Paris, 21 November 1825), continued his business and was also a geographer of the king.